1) Added a 64bit version. 2) Updated to IDA SDK 6.8 version. An IDA Pro Win32 target clean up plug-in by Sirmabus. 1. Convert stray code section values to "unknown". 2. Fix missing "align" blocks. 3. Fix missing code bytes. 4. Locate and fix missing/undefined functions. but it might still be helpful on Delphi/Borland and other complied targets. Added 64bit version. Improved find/fix alignment pass. I've updated my what I call "informational comment plug-ins". They are three plugins meant to be applied together in sequence. I usually run these after I run my "Extra Pass" (cleaner fixer) and "Class Informer" (if the target has C++ Run Time Type Info). It's easier to express what they do in "before and after" images. it probably won't look that significant to you. First you see a '5'. This tells you there are 5 references to this function. The count can give you some hints about the relevance of a function and some idea of it's hierarchy. that it might be some kind of common library function. Then you see the tag "STR:" which indicates that what follows are strings found in function. might be about (literally a "debug window"). Then finally you see the tag "<API*>". This lists API functions (from the import table) that this function is using. in fact one that creates a "debug window". Not even looking at the function we can just glean this from these comments alone..
All that information is visible even as a reference! The reference count comments are also placed for data items. you can get some idea of their significance. some assumptions that it's an important data item. After while this extra info will feel natural, useful, and intuitive. To me it's a world of difference. If I look at a plain IDB now with out this I feel sort of blind. Hopefully you will find these information comments useful. However it does have some problems and is not the ideal setup. For one thing it might be harder to pick out your own comments with these placed. Then if you accidentally overwrite a comment set with your own you'll loose them. You can't just run the plugins again to replace them (it will cause a mess). If you use BinDiff or the open source Diaphora to port over your comments from one IDB to the next then that can make a mess of these comments too. And what if you want to add your own auto-generated comments? If nothing else they are handy for a debugging or development feature; similar to how people set the background color for the same purposes. Too many function and data comments will become visual noise. What would be ideal here to use a custom view! Then these comments could show up more natively like IDA's own on the fly cross reference (light green colored) comments. With this type of setup this data can be globally switched on and off, the text could be custom colored, users could add there own per function and data item text (through another plug-in or via Python bindings, etc.) and can optionally be persistently stored inside the IDB. 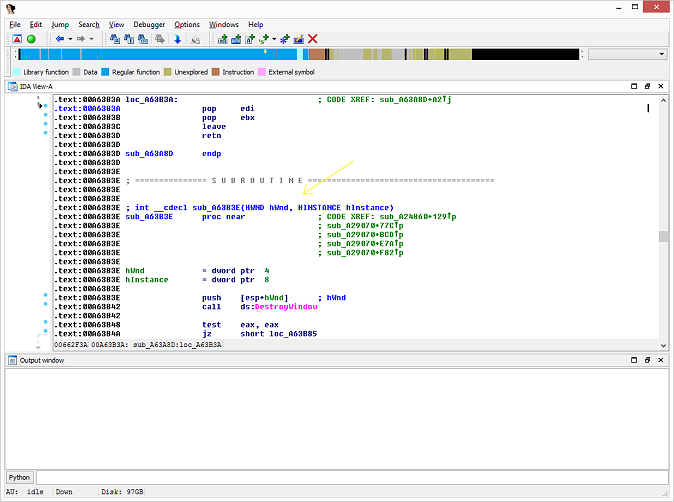 This view will look pretty much the same as the IDA "Disassembly" view your already familiar with, it'll just show extra information above the function header, below any exiting comment(s). Finally the data could be ported over from one IDB to another by using names or better, be added to the port tool functionality it's self. [May 2015] Updated to IDA 6.7 and now there are 64bit versions as well. IDA Pro / Re: IDA2PAT Reloaded doesn't seem to log all signatures. 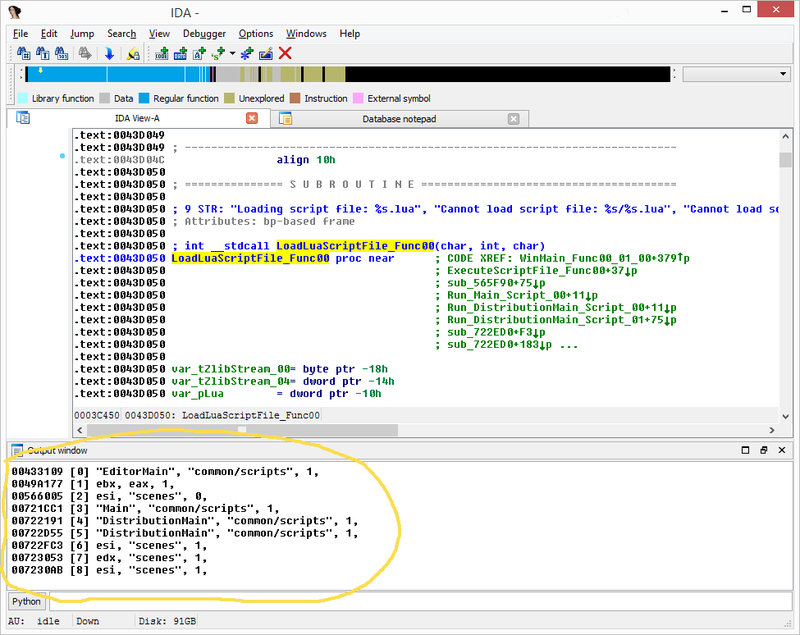 I've just downloaded your IDA plugin for generating .pat files however it doesn't export sigs for all of the functions. As you can see 79 patterns of 14835 functions. I also used idb2pat python script which exports fine but it doesn't seem to mask pointers... ipso facto generated .sig file doesn't match all the functions. Re: IDA2PAT Reloaded doesn't seem to log all signatures. I'll add that to the list of the one I need to update and make a 64bit version of. I've updated most locally and should have them up on my website soon. Reminds me too there is an update to FLAIR that should add a little more integrity to sigs now that I could look into. I made my version to only save user named functions. To reject all the default ones like "sub_402230", etc. The original tool tried to use flags to determine if functions were "auto-generated" or not but those flags are unreliable so I use a string filter. Could be something messing up there. The whole pattern matching thing is a loaded issue. First of all IDA's FLAIR system is pretty ambiguous. 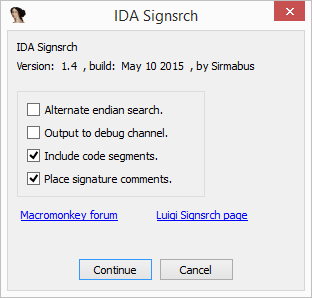 That's why you'll see IDA placing bad signatures for it's run time set, etc. I've done research in the area and made my own simple signature tool still in progress I haven't released. The biggest problem with FLAIR and in general similar simple signature matching is they don't consider things like uniqueness, commonality, etc. Imagine you are interested in a "std::string" constructor function. The problem is even though you name one of them there could be many of the same exact function. To make matters worse it could be a small function with very little details (like immediate values, etc.) to discern it form any other number of similar functions. Then sure your named one should end up in your .PAT file (from a IDA2PAT tool), but will fail in sigmake.exe if there is a conflict (because two or more have the same signature, etc). If your resolve the conflict (by editing the result file) and the signature makes it to your .SIG file imagine now applying it to a new/updated target. It's going to apply the name to the first match it finds. It's probably not going to be the one you wanted it to match too. On top of that it will match a bunch more (all with serialized names). FAIR is pretty dumb to the whole scene. It doesn't know about the degree of significance, about similarity, relative positions, etc. Then another issue is knowing properly how to mask out the non-exclusive features in the PAT generation. So when you have things like "mov dword_1B4B52C,eax" the tool should keep most of the details, maybe only masking out the "dword_1B4B52C" part and keeping the rest. The address won't (probably not anyhow) translate over when applied as a signature so it needs to get masked. But actually when you think about it, it is a significant detail. If nothing else there is a relative position hint in it somewhere. Just that AFAIK no existing tool stores any meaningful context of it. What is needed is a new type of tool that considers the whole picture. And some things will just have to go. For functions that can't be tracked reliably it will say so and reject them, etc. I'll update my variation to a newer IDA SDK as that might help. But I think any more time spent on FLAIR (a broken system from my perspective) would be kind of a waste. Here is the Python version of a script I first did in IDC some years ago that I use a lot. I use it to dump function arguments out; most useful for ones that have strings. The typical case is when you find some sort of dump/log/assert functions that have many interesting strings. If you see something of interest you click on the address to jump to the function for examination. 1) Go to the function of interest and click on the name or inside of it so it's selected. 3) It will ask you for an argument count (three in the example above). General Discussion / Bombarded by spam..
Not so surprising, my little forum here gets bombarded with spammer bot accounts despite using Google reCAPTCHA, etc. Getting a half a dozen or so spam accounts every day. Until I get better anti-spam measures had to set admin account approval for now..
Update: Apologies to those that tried to register in the last month or so. Forgot to check and out of all that needed approval most were bots anyhow. 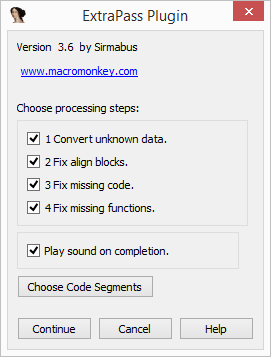 MacroMonkey™ is a free, feature packed macro/botting scripting system for Windows. Intended to be a friendly scripting environment to make MMO macros and bots from the simple to the complex. Aimed mostly towards MMO games, but can be used to automate almost any windows program. You can send simulated key presses, mouse moves and clicks, read screen pixels, interact with windows and processes at a low level, talk between other MacroMonkey instances, and much more. Uses the powerful, fast, lightweight, and easy to learn Lua scripting language, with addition of many extensions for automation needs. In development for several years, coded in optimized C/C++. Built for high performance and low resource use to run well on anything from a Pentium III to the latest Windows machines. Direct Window and process, access and manipulation. Simulated mouse and keyboard inputs. Screen pixel and color space support. Custom network library for transmitting data between multiple instances over LAN, or Internet. Support for communication with external processes. Windows registry, "INI" and XML file support. The best way to start and see if MacroMonkey is the tool for you, is to try some of the examples in the "examples" directory. 1) Open a server connection. 2) Open one or more client connections. 3) Press a key in any of the consoles to send a packet, and get one back. Creates an instance of Examples\Data\TestProcess.exe with DLL Examples\Data\TestInject.DLL injected. 1) Press '1' or '2' in the console window to send an IPC message to the process. 2) Press '1' or '2' in the process window to send an IPC message event to the script (console window). And try the many more examples/samples/tests in the "examples" directory.. There are samples for most of not all of MM's libraries. MacroMonkey uses the powerful, fast, lightweight, and easy to learn Lua scripting language. Lua version: 5.1.4 as of September 2009. Lua is a tried and true language used by many for industrial applications, video game logic, configuration, etc. It's first release was fifteen years ago. Since then it has been banged on (tested) a lot and lot of bright minds have worked on it. If you used any other programming language then Lua will probably come easy to you. Sirmabus: I found it similar in syntax to the C language. And it's easy for me to switch between C/C++ and Lua. Lua allows you to create your own object oriented language features through the use of meta-mechanisms instead of implementing these features directly in the language. It's very flexible and allows you to create your own "class"/object concepts with inheritance, encapsulation, etc. See: Object-oriented programming (OOP) and Lua Metatables - Classes. 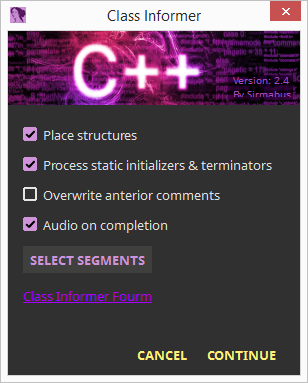 Building C/C++ extensions/libraries is easy. 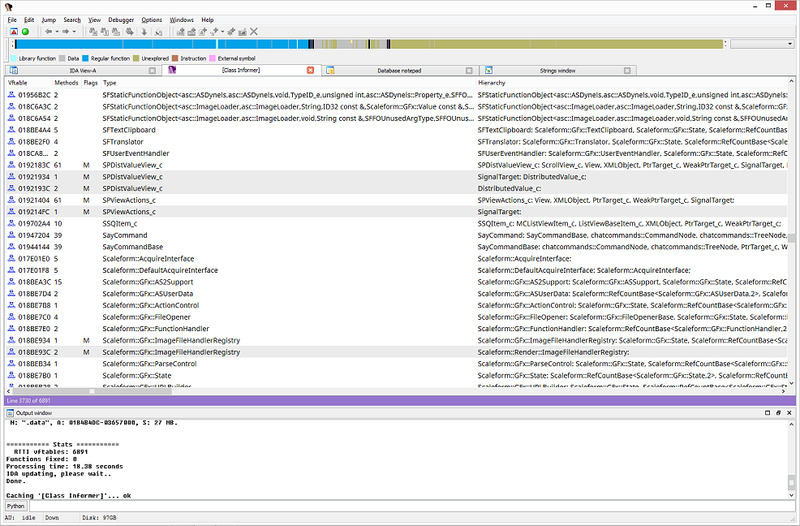 Just include a single header and library file from the MM SDK folder. And use the Lua C API (see "The Application Program Interface") or one of the many binding setups like "Binding Code To Lua" et al. 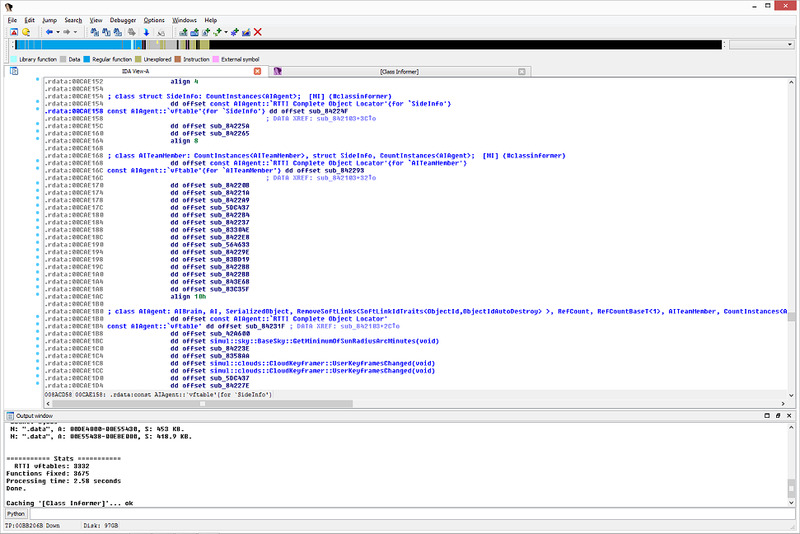 To communicate to a service DLL (a remote/injected DLL that provides "services") the MM IPC facility can be used. This way communication is done via raw data (with the help of the MM Pack library). No need to create a go-between extension DLL, nor even learn the Lua C API. MM has the base Lua Standard library (with some improvements), in addition it has many libraries to facilitate automation use and added script utility. MM with simplicity in mind, uses Lua tables, metatables, and metamethods to make it's libraries more object oriented and modular. input User Input, both actual and simulated. hash Data hash and checksum (MD5, etc.) lib. xml LuaXml XML file lib. speech Text to speech engine. server, client, ClientConnection Lan/Wan network communication system. ipc IPC (Inter-Process Communication) system. gui.Window, gui.Menu, gui.TabControl, ... GUI window system and controls. -- Show a simple GUI message box with "Yes", "No", and "Cancel" buttons. 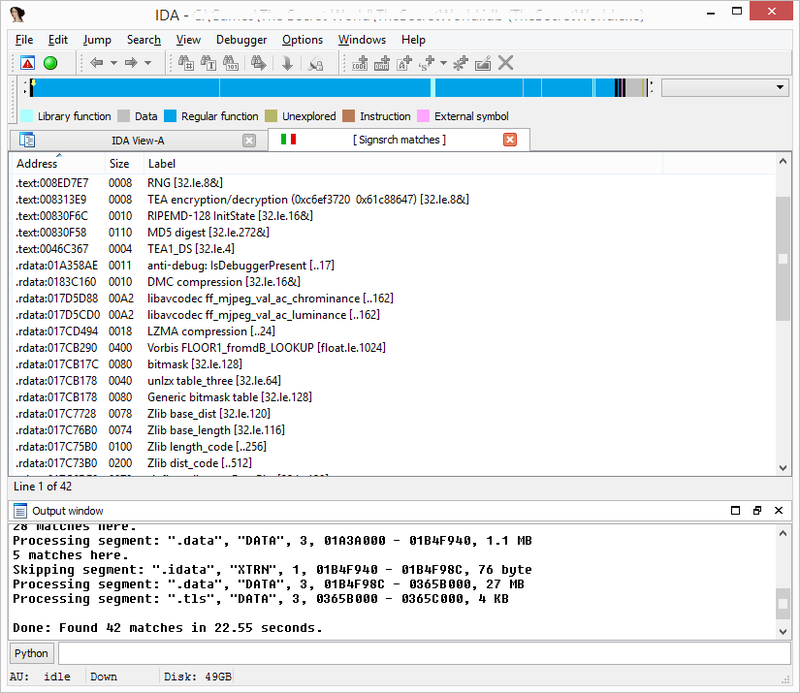 An IDA Pro MSVC object RTTI vftable finder, fixer, and lister plug-in. Lists found RTTI structures and C++ classes. Will now scan all "DATA" type segments. Before would only scan the first ".rdata" and ".data" named segments. Added a "segment select" to allow manually selecting the segments to scan. 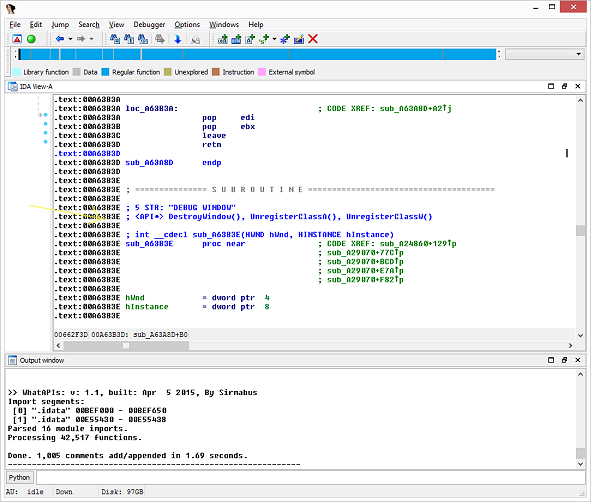 Updated to IDA SDK 6.9 and now using MSVC 2015. [May 2015]: Version 2.0, major update. Added a fully functional 64bit version. Different, more accurate scanning method. Fancy "material design" inspired user interface. To build requires a minimal Qt 5.4.1 SDK install. and my UI customizations are broke, etc. Hopefully I'll find a nice way using the latest Qt stuff to properly do my custom segment selector, etc., sans Windows API hacks. In the process of updating to a new IDA SDK and making 64bit versions. To avoid conflicts I no longer compile my plug-ins with default hot keys. You'll have to either edit your "plugins.cfg" and add them there or invoke from IDA's "Edit-Plugins" menu. Also I'm usually compiling these with the latest IDA SDK (version 6.7, and about to update to 6.8 as of this writing). For those using 6.6 or what ever you'll have to fix the differences and recompile with what ever SDK you have. See https://www.hex-rays.com/products/ida/6.8/index.shtml pages to compare API updates. work since while I saved my SQL DB I didn't do ab "export" that would have made it much easier. Still a bit under construction, figuring/deciding on a new layout, etc.